Using 117 point Hartmann sensor wavefront technology in TL-6000/TL-7000, superior measurement accuracy and speed for all types of lenses is guaranteed. Green LED measurement light allows to measure high index lenses without the need of Abbe compensation. Blue light filtering lenses have found their way to the optic shops and play an important role to protect the eyes from harmful blue light emission of LED screens. 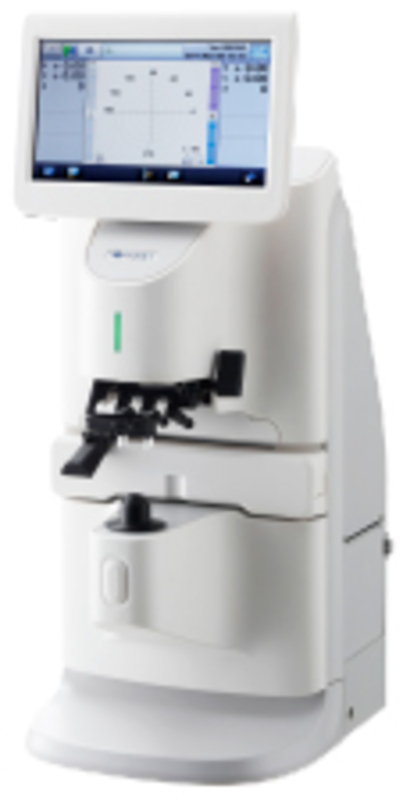 Show your patients the transmittance of blue light (465 nm) and of UV light (375 nm) passing through their lenses simultaneously while measuring the optical power. Various grid patters will assist you to recognize the lens marks easier as well as to visualize the distortion of multifocal lenses. The grid patterns are changed by swiping the finger over the 7-inch touch panel. Visualize the progression zone of multifocal lenses with the simple power mapping function. The use of PD-value and the L-value is recommended and is an exclusive function of TL-7000.